On May 20th, Principal Swann got to meet with U.S. Secretary of Education John B. King Jr. and senior U.S. Department of Education officials, for a day of learning and advising, as part of the Principals at ED effort in Washington, D.C. This fifth meeting in the series of Principals at ED visits focused on the “Principal Pipeline, Retention and Support.” The goal of these visits is to bring groups of innovative and successful principals from across the country to the Education Department to learn more about federal programs and to share experiences from their jobs as school leaders. Throughout the day, the principals who attended met with senior staff from across the agency to learn about and give input on a variety of the Department’s programs, policies and initiatives. 1st Grade Learns the Parts of a Computer through song! 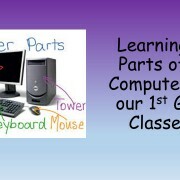 A big part of our Kindergarten and 1st Grade Computer curriculum is learning the key parts of a computer. Students learn that the mouse, keyboard, monitor, CPU and headphones are all essential parts. As they progress we begin finding these key pieces in other types of technology like laptops and tablets. Here are some of our first grade classes singing a song to help them remember these important pieces! https://wjccschools.org/ll/wp-content/uploads/sites/12/2016/05/Web-parts-of-a-computer.jpg 720 1280 Kelly Lapointe http://wjccschools.org/rb/wp-content/uploads/sites/12/2014/05/logo.png Kelly Lapointe2016-05-23 15:08:022016-05-23 15:09:581st Grade Learns the Parts of a Computer through song! Respectfully submitted by RBES’s Nominating Committee. The Farm Bureau generously donated a Learning Barn bookshelf to the Rawls Byrd Media Center last week. 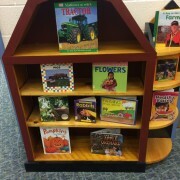 The Learning Barn shelf will display books about farming, healthy eating, and farm animals.